I used to work a Pitch Till U Win, but it didn’t have the character of the hand-carved and painted ring toss pictured above. Featuring caricatures of a gendarme, sailor, artistocrat and grouchy old lady, the game is equipped with a mechanical device that makes the legs of the figures come to life in an eccentric dance. With a pre-sale estimate of 12000-15000 euros ($16,257-$20,321), this antique game is beyond my budget, but it’s fun to window shop. 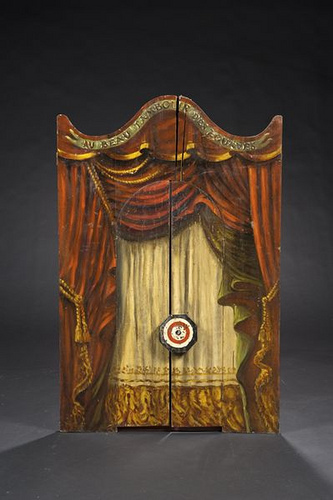 The ring toss is part of a magnificent collection of fairground art, including rare carousel figures, decorative items and games on the block at the Paris auction house Cornette de Saint-Cyr. Collected, researched and restored over a 40-year period, the Fabienne and François Marchal Collection of European Carousel and Fairground Art will be sold in three sessions on September 28 and 29. As a carny kid who grew up working the Pitch Till U Win, Slot Roll Down and Bumper Joint, which have since disappeared from the American midway, I have an abiding interest in vintage carnival games. 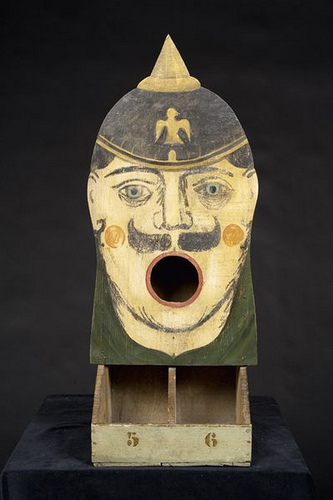 In the early 1980s, an elite group of dealers began exhibiting primitive carnival wheels, ball-toss figures and shooting gallery targets at the fall antiques show in New York. Viewing these exhibits, I felt pleased and proud that these midway games created by unknown artisans had been transformed into much-admired folk objects. The high prices shocked my frugal mother, who first went on the road during the Great Depression of the 1930s. In the 19th and early 20th centuries, successful concessionaires were adept at building their own games, freely borrowing ideas from the fellow down the midway and the catalogs of supply houses catering to the carnival trade. My mother, who grew up speaking French, would have appreciated these hand-crafted French fairground games. 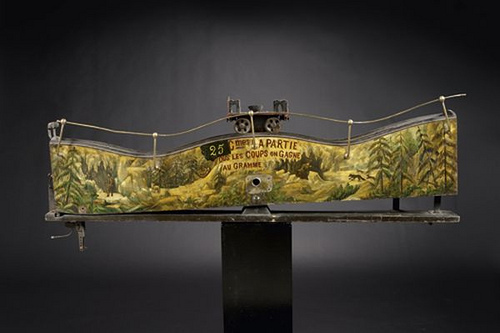 Great entry- thanks-ever seen that museum of Automata out in SF? Beautiful, beautiful. What is it that gives this stuff its magic? It’s almost alive.